A critical edition of Malcolm Lowry’s novella Swinging the Maelstrom is available now from the University of Ottawa Press, and three members of the EMiC community have their names on the cover and the fruits of their research within the pages. The text was edited by EMiC collaborator Vik Doyen, who researched Lowry throughout his graduate degrees and did a genetic study of Lowry’s works for his dissertation. 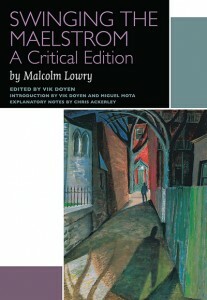 Doyen previously edited an edition of Lowry’s Lunar Caustic (an alternate name for Swinging the Maelstrom). EMiC co-applicant Miguel Mota has also edited an extensive list of Lowry works and joins Doyen as introduction co-author for Swinging the Maelstrom. Chris Ackerley, another EMiC collaborator and editor of Lunar Caustic, contributed the notes to the Maelstrom edition– an edition that lays out all versions of the text that exist under all of its various titles. EMiC scholars Paul Tiessen and Patrick A. McCarthy also contributed to this critical volume. We are a group of graduate students from Simon Fraser University working on a collaborative essay under the supervision of Dr. Michelle Levy about the role of student labour, training and collaboration in Digital Humanities projects. To this end, we have constructed two surveys to gather anecdotal and quantitative evidence about student involvement. Students: Click here to take the student survey. Faculty: Click here to take the faculty survey. We welcome your participation, and invite you to circulate this survey widely amongst your students and colleagues. The survey will be available until 11:59 P.M. (PST) on Monday, November 25th, 2013. A copy of the aggregated findings of this survey will be available to all participants. This post was written by Paul Barrett. My project is a somewhat crazy attempt to locate Austin Clarke’s writing within the thematic and generic boundaries of Canadian modernism. Why crazy? Well, what does Clarke’s work – even his early writing – have to do with Canadian modernism? What generic and thematic connections are there between Canadian modernism and Clarke’s work? In addition to addressing these specific questions, I am also interested in why Clarke’s writing – particularly his early work – has been largely ignored by Canadian and Caribbean critics alike. My working thesis is that the untimeliness of these works – coming too late for modernism and too early to be qualified as ‘multicultural writing’ – the generic hybridity of Clarke’s early writing, and the transnational quality of these early works has baffled critics. 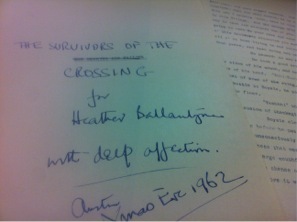 I focus on Clarke’s first novel, The Survivors of the Crossing, a transnational Canadian novel concerned with questions of race and nation that was written throughout the 1950s and 1960s and published in 1964 (before Klinck’s Literary History of Canada!). The transnational bent of Clarke’s early novels, the focus on representations of race and racism in pre-multicultural Canada, and the formal qualities of Clarke’s work all made it difficult for Canadian critics in the 1960s and 70s to place Clarke’s writing within a familiar framework. Thus his early novels have received virtually no critical attention despite being notable commercial successes. To attempt to understand this gap in Canadian scholarship I’m beginning with the provocative hypothesis that Survivors may be understood as an instance of late modernism in Canada. It is perhaps an instance of what Kronfeld calls “marginal modernisms” that lie beyond “the powerful cartographic paradigm: international modernism = Europe + United States” (4). However, the question remains: what aesthetic / formal / thematic elements in Clarke’s work might locate Survivors within Canadian modernism? And if the text can be identified as a form of late modernism, how might it redefine aspects of modernist Canadian fiction? Survivors begins with a letter from Canada to plantation workers in the Caribbean. The letter writer locates Canada at the center of global modernity, insisting that “Canada is a real first-class place!” and that “the word Canada mean something like progressiveness!” (9 – 10). The novel thus seems to invert colonial modernity by recasting Canada as a sign of modernity and contemporaneity and the British system of plantation labour as the relic of a less progressive era. Movement is also a central theme of the novel as it is the movement of Caribbean people to Canada that leads the characters to see the plantation system anew. 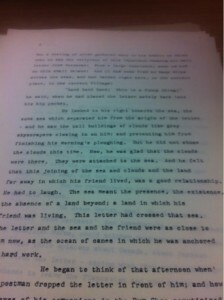 Clarke’s novel thus accords with Glenn Willmott’s argument that “The grounding of experience of modernity … in modern Canadian fiction is, therefore, not that of the dichotomy between or movement from the country to the town or city – the dichotomy of rural versus urban – but the deconstruction of that dichotomy or movement … the subtle ‘urbanization’ of the countryside itself” (152). In this case, however, it is the Caribbean countryside that is urbanized with Canada figured as a sign of global modernity. In what ways, then, does Clarke’s reimagining of Canada as a sign of modernity transform the manner in which he engages with the themes and motifs of Canadian modernism? I am using topic modeling and Vocabulary Management Profiling software to try and answer these numerous questions. Topic modeling is a digital method of textual analysis that identifies recurring ‘topics’ or themes in a text and the relations between various topics within a single text or across multiple texts. I investigate the ways that topic modeling can help us understand the relationship between depictions of movement and space in Clarke’s novel. 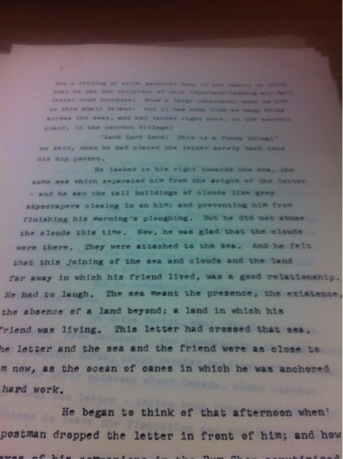 I am working in the William Ready Archives at McMaster University where Clarke’s archives (more than 22m of material!) are stored. I am also using Vocabulary Management Profiling software, which identifies marked shifts in an author’s use of language; I use this tool to assess the relationship between Clarke’s use of nation language and conventional English. I am particularly interested in tracing how Clarke’s use of nation language changes across drafts of the novel and may be affected by editorial intervention. I’m still in the beginning stages of my project – scanning the multiple drafts of Clarke’s novel, converting the images into documents, and exploring the different methods for topic modeling. However, I hope that these methods will provide insight into the relationship between Clarke’s first novel and Canadian modernism and that Clarke’s work will provide a useful case study for understanding the implications of these digital methods of textual analysis.